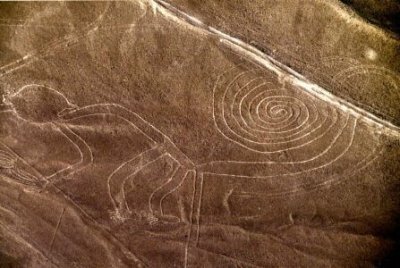 Located in the arid Peruvian coastal plain, the geoglyphs of Nazca and the pampas of Jumana cover about 450 km². These lines, which were scratched on the surface of the ground between 500 B.C. and A.D. 500, are among archaeology's greatest enigmas because of their quantity, nature, size and continuity. The geoglyphs depict living creatures, stylized plants and imaginary beings, as well as geometric figures several kilometres long. The lines were first spotted when commercial airlines began flying across the Peruvian desert in the 1920's. Passengers reported seeing 'primitive landing strips' on the ground below. 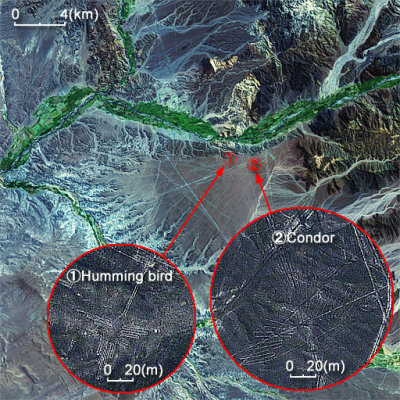 Lines and geoglyphs of Nazca in a Landsat-7 image (30 m resolution, 26/04/00) with details of a QuickBird image (0.6 m resolution, 16/09/02). Source: Tokai University Research & Information Center, Japan. Monkey, bird and spider geoglyphs. Photo: Association Dr. Maria Reiche. Since their discovery, various theories have been proposed regarding the methods and motivations underlying the lines' construction. Why would anyone bother to make figures that could only be appreciated from the air ? Imaginative interpreters postulate these to be landing strips for extraterrestrial vehicles. Other explanations reach from a gigantic star-observatory over sacred streets and ritual places to irrigation systems. 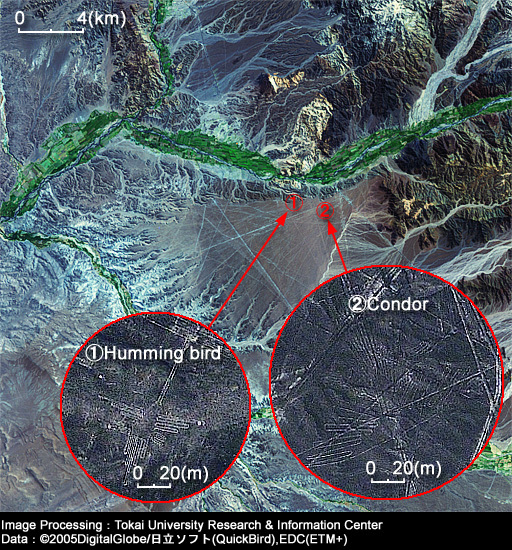 Till today, the mystery of the Nazca lines remains intact. On the pampa, south of the Nazca Lines, archaeologists have now uncovered the lost city of the supposed pre-Columbian line-builders. This city, Cahuachi, was built nearly two thousand years ago and was mysteriously abandoned 500 years later. Since 1994, the Nazca lines are protected as UNESCO World Cultural Heritage.